The Apple Watch Is Here And Another Tech Hype Cycle Commences : All Tech Considered Apple unveiled its first new product line since 2010, a wearable computing device called the Apple Watch. But is it a game changer? You can't trust all the hype. Apple CEO Tim Cook announces the Apple Watch in Cupertino, Calif.
Apple's big new product will live on your wrist. It's called the Apple Watch, in a notable move away from "i"-branded products, and it will be available in early 2015, starting at $349. It comes in two sizes and packed with all sorts of futuristic features, like being able to pay for products or wave open a hotel room with it. And send your heartbeat with it (not that I know what the use case is for that is unless you're a newborn). 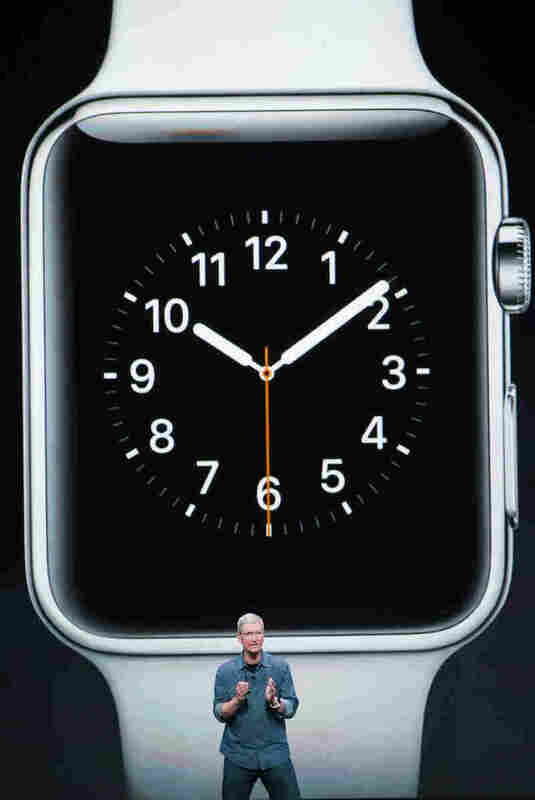 "It's the next chapter in Apple's story," Apple CEO Tim Cook said at the watch's unveiling. And while the Apple faithful are excited, and Apple shares traded up briefly on Wall Street, it's difficult to predict what will become of the Apple Watch — it's too hard to see through all the tech hype. "As key members of the tech industry and trade press gather on a clear Tuesday morning, Tim Cook leads much of Apple's senior management in the introduction of a simple, wearable touchscreen device. Priced around $300, it immediately attracts complaints that it's too expensive, since wearable fitness devices are less than half the price; Supporters claim its support for a tightly-defined app platform differentiates it enough to justify the higher price." That's impressive in its prescience. As these things go, what will follow are days and days of product reviews of the watch, what it has, what it doesn't, hand-wringing about whether watches will really come back, whether there's too much going on on the screen, security questions, collaboration questions, criticisms that Apple is too walled off, etc. etc. etc. I’m sure the Apple Watch is going to do super well. It’s just not for me. And that’s fine. Not everything has to be. I expected iWatch to be skinnier, do less, less techie. It failed on all three fronts. Finally an Apple product I am not likely buying. The gadget-lovers among you probably can't get enough of it. It's the "Technology Trigger" in the tech hype cycle that industry analyst Gartner has laid out. Following this triggering event are the other stages of the cycle: the Peak of Inflated Expectations, Trough of Disillusionment, Slope of Enlightenment, and if there is mainstream adoption, the Plateau of Productivity. But the hyped-up coverage at this trigger stage can belie an underperforming product; something that doesn't necessarily change the game, as previous Apple products have. It's just too hard to tell right now, through all the bluster. As it happens with technology products, so many of them tend to be overestimated in the short run (ahem, Google Wave, the Segway, Groupon) and underestimated in the long run (did anyone hail magnetic stripes 50 years ago and expect they'd still be with us in 2014? ).